Words are the building blocks writers use to create their books, articles, and blog posts. 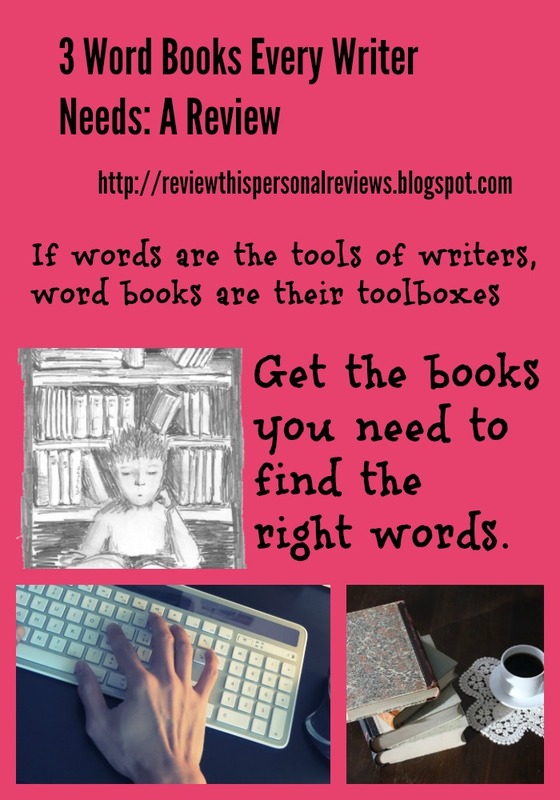 In this post I will introduce you to three word books every writer needs to have for reference, not counting the dictionary you probably already have. These are the books I consult on a daily basis as I write. Do you have all of them yet? If not, it's time to get them. Between them you will always be able to find the right word for your writing project. I use all the books in the photo, but have only reviewed the three that are still in print. If you purchase from links on this page, I will get a small commission from Amazon, since I am an affiliate. The first Thesaurus I normally consult is the Oxford American Writer's Thesaurus. I have reviewed this one thoroughly in my blog post, January 8 is Thesaurus Day, along with the old Roget's Thesaurus. I used it because that used to be THE thesaurus, the only one most people used. There are more choices now. Roget's has been updated to dictionary form now, but you can still get a modern version of Roget's that retains the original organizational format if you prefer it. 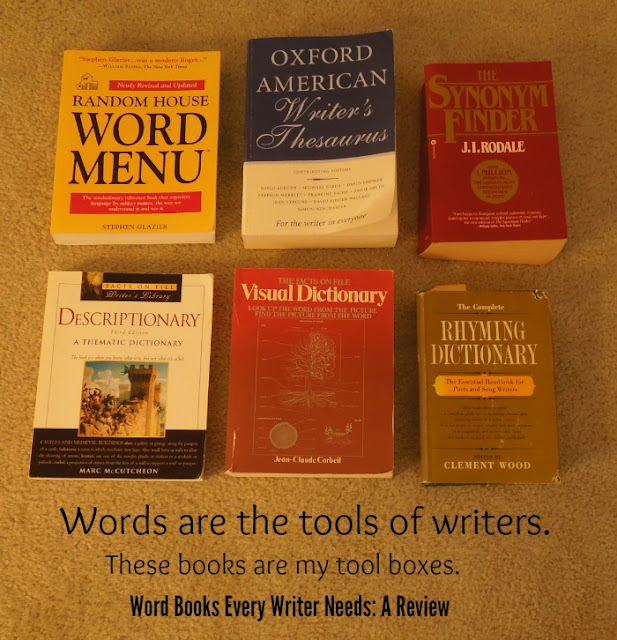 Whichever version seems more user friendly to you, a thesaurus is a must-have tool for any writer. If you are hobbling along with an old version, it's time to update. A descriptionary is a thematic dictionary. You use it when you know what a word is related to, but not the exact word. Words are arranged according to subject. For this review I'm using the Facts on File Descriptionary, Third Edition. Afghanistanism journalist's term for the avoiding of local controversy by focusing news coverage on distant lands. blacksmith an uninspired but industrious reporter who simply pounds out stories day after day. Also under the Publishing and Journalism topic are Book Publishing, Book Terms, and Headline Types, all with their own lists of defined terms. A descriptionary is just the book to have at hand if you are writing about a subject you are just beginning to explore that has a lot of its own jargon or technical terms that may not be familiar to you. My descriptionary covers Animals and Insects; Architecture; Art; Clothing; Electronics; Environment; Human Body and Mind; Language ( which far from just explaining grammatical terms, devotes several pages to drug and crime terms, urban street and rap slang, and words about words); Law, Magic and the Occult; Medicine; Military; Music; Occupations (where I found Publishing and Journalism); Performing Arts and Broadcasting; Physics, Chemistry and Astronomy; Religions; Sports; Tools; Transportation; Weapons; and Words and Expressions You Should Know. That last topic purports to sum up the words every literate person should understand -- the ones you hear on the news or see in magazines, newspapers, and authoritative blogs. You probably studied most of them in secondary school and were tested on them in college entrance exams. Also included are terms like according to Hoyle, Hoist with one's own petard, and genie out of the bottle. Besides providing just the topical words you need for works in progress, The Descriptionary also can give you new ideas for additional subjects to write about. Although I'm using the Third Edition, the Facts on File Descriptionary, Fourth Edition is now also available at Amazon. If you click through, you will see below the listing a tempting assortment of other word books for writers, one of which is The Master List for Writers: Thesauruses, Plots, Character Traits, Names, and More. Whichever you choose, be sure you have one of these thematic word books close to your desk when you write. A visual dictionary is what I use when I've seen something but I don't know what to call it. Unlike a descriptionary, it only is useful for tangible objects that one can see -- not for ideas and abstractions. Think illustrated charts and diagrams arranged by subject. Up until now, I've only had my old 1986 edition of the Facts on File Visual Dictionary. Its illustrations are black and white, but they do the job. Unfortunately, this edition lacks most of our new technology, but it was a great help when I was writing my blog post Watch a Forklift Reach Truck Load a Lumber Truck. I knew nothing about construction or forklifts, except that I was pretty sure I was watching a forklift. I looked under the Heavy Machinery topic and drilled down to Material Handling. There I found my forklift reach truck and knew what to call it. Today I started searching for something more up-to-date. I was delighted to see that DK had published a 2011 edition of its Ultimate Visual Dictionary. I have sold DK books for years.They combine gorgeous color illustrations with condensed information. The very detailed and cut-away illustrations all have their parts labeled down to the most intricate. I know that because I sat drooling over the 2000 edition at the library today and did not want to put it down. It is inviting and informative. It's easy to get lost in looking at all the attractive pictures. That means even children will want to look at it, but the information is on an adult level. I'll bet when you looked at the row of visual dictionaries above, this was the first to catch your eye. I wanted to bring the book home with me. The one I own doesn't compare well to it. What The Ultimate Visual Dictionary covers, it covers thoroughly. It does lack coverage of of some more common household objects that are more extensively covered in the Facts on File Visual Dictionary and the Macmillan Visual Dictionary, a volume I also looked at while at the library. It was a 2002 edition, and it was in color. Both books were written by Jean-Claude Coreil, so the topics are very similar. Miriam Webster's Visual Dictionary is also written by Jean-Claude Coreil, so I'm guessing it has almost the same content as the Macmillan Visual Dictionary. It is recommended for anyone at least eight years old. It does not have a "look inside" feature as the Ultimate Visual Dictionary does. One Million Things: A Visual Encyclopedia, is an entirely different animal than the other books. It will, for example, show you lovely pictures of leaves with a bit about each type, but it doesn't appear to show you the parts of a leaf in detail as the Ultimate Visual Dictionary does. I am drawing my conclusions on One Million Things solely by looking at the few pages Amazon shows me. It's a beautiful book and I think any one of school age and above would enjoy it and learn a lot from it, but after all the books and descriptions I've handled and read about today, the one I want to buy to supplement my out-of-date Facts on File Visual Dictionary is still The Ultimate Visual Dictionary. Most of the books are used the same way. If you know the word and want to know what the object looks like, you use the index at the back to find the word in its visual context. If you know the topic area, you drill down more specific topics until you find the page and illustration that your word labels. None of the books cover every subject and there is a lot of crossover. I would recommend getting The Ultimate Visual Dictionary and one other. Then you won't miss much. Links to all the books except the Facts on File Visual Dictionary, which has its own text link, can be found pictured at the beginning of this topic. If you write and don't have a visual dictionary, you could make good use of one. Why not get one today? If you have a comprehensive thesaurus, a descriptionary, and a visual dictionary, you should be able to find most of the words you need. Then your brain will select the most appropriate one for your context. Sometimes our brains just won't bring the words we know and want to use to mind, especially as we grow older. These books deliver them back to our brains again. What reference books for words have you found most helpful? Please mention them in the comments. The comment box is just under the related posts, below. The sharing buttons are just below this last photo, which was designed to share on Pinterest. Why not pass this information on to other writers, students, or home school families? Great tools for a writer. Pinned it! Thanks, Heather. Without them I'd forget a lot of words I once used often. My senior moments are increasing. I actually need the Descriptionary myself, and not just for writing! I have heard people actually use words that I would like to see defined. Colloquialisms frequently send me to the computer to look something up. It would be nice to have it all in book form. I know we all use our computers for reference, dictionaries and the thesaurus, but I like having the book. There is something about a book that fills all of my senses and excites my brain. The computer simply cannot do that. I agree. And I want a real book I can flip through easily and bookmark. So many of my Kindle features no longer work, and it's horrible trying to review a book from my Kindle because it's hard to find the pages I want - if they even have page numbers. The Visual Dictionary was the sort of book I just wanted to keep looking at subject after subject. Loved the plant and animal and human body topics. I can't imagine having a reference book like that on an electronic devise. I keep all my reference books so close to my computer all I have to do is reach for them. Barbara, the Descriptionary sounds like a 'must have' book for a writers' library, and the Visual Dictionary looks fascinating. I definitely agree that writers need writing tools like these. I majored in journalism in college and when I left for school my grandfather gave me E.B. White's "The Elements of Style" (originally written by a Cornell English professor William Strunk and my grandfather attended Cornell University). :) I still have it some 50 years later and it was my very first writer's resource. It's a great book. I have it myself, and still have copies left in inventory I'm trying to get rid of in a way that satisfies the government, since I'm no longer working the book business. I didn't mention the Word Menu because it's out of print. It'a another amazing book full of subject-related word lists. One I just turned to at random was "eating verbs." Sometimes our brains know the words, but just can't retrieve them when needed without a bit of help. I definitely could use a couple of these reference books. My well-loved copy of Roget's Thesaurus, given to me by my parents nearly 50 years ago, was lost in our house fire and I haven't replaced it. I'd like a Descriptionary, too. My writer's toolbox definitely needs refilling! The latest edition of Roget's can be purchased in two formats -- the old one and the dictionary format. You really should update, since thousands of words have been added to the language during the last fifty years. The Visual Dictionary is the new book I will buy. It's a must-have book for a nature and garden writer. It's also a great idea generator. I also still have the Elements of Style and a favorite, On Writing Well which is short, sweet and succinct. I have both those books as well. thanks for mentioning them. There just wasn't room to review everything in one post. Thanks for calling attention to these books. I need almost all of them. I hope you will decide to get them. I think you would enjoy the visual dictionary as much as I will. These are great suggestions! I have never heard of Descriptionary. It sounds like a really good reference book to have on hand. It really is, but I also love my Writer's Thesaurus. These are something I could use. Thanks.